The Medial Compartment of the Thigh is one of the fascial compartments of the thigh and the adductor compartment of the thigh is well developed. Its counterpart in the arm has gotten degeneration during the course of development and is represented only by a feeble coracobrachialis muscle of the flexor compartment of the arm. Anteriorly by the anterior intermuscular septum which divides it from the anterior (extensor) compartment of the thigh. Posteriorly by an ill defined posterior intermuscular septum which divides it from posterior (flexor) compartment of the thigh. The posterior intermuscular septum is ill defined and incomplete as a result of presence of a composite muscle, the adductor magnus, comprising 2 parts- adductor and flexor (hamstring) belonging to adductor and flexor compartments of the thigh, respectively. Muscles: Adductor longus, adductor brevis, adductor magnus, gracilis, pectineus, and obturator externus. Arteries: Profunda femoris artery and obturator artery. The obturator externus is located deep in this region and is functionally associated with the gluteal region. It rotates the thigh laterally; the main function of others is adduction of the thigh. The muscles of the medial compartment of the thigh are ordered into 3 layers. Anterior (first) layer is composed of pectineus, adductor longus, and gracilis. Middle (second) layer contains adductor brevis. 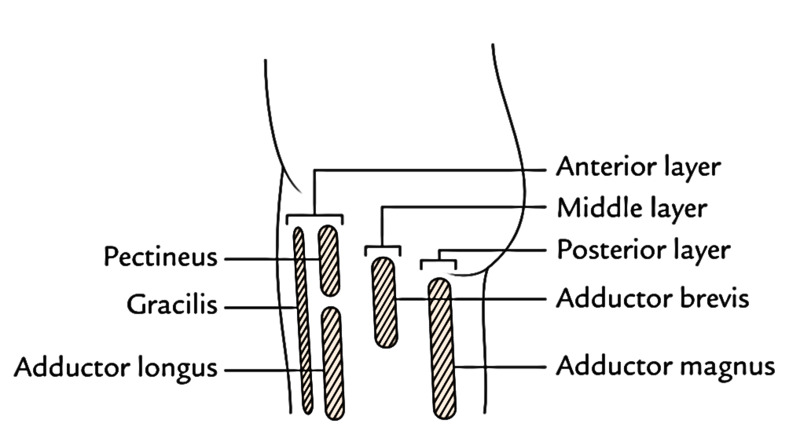 Posterior (third) layer is composed of adductor magnus. All the muscles of the adductor compartment of the thigh are supplied by the obturator nerve. Two muscles of the adductor compartment of thigh, viz., pectineus and adductor magnus, are complex muscles, for this reason they’ve double innervations. 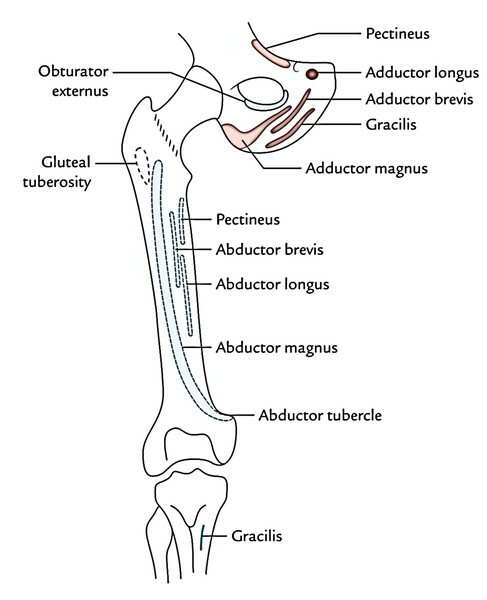 The pectineus is supplied by the femoral and obturator nerves while the adductor magnus is supplied by the obturator nerve (posterior section) and tibial part of sciatic nerve.